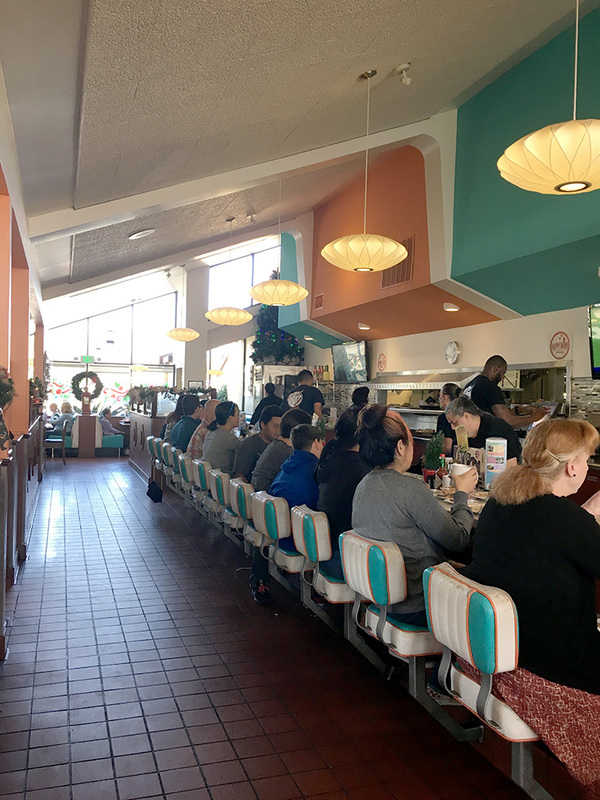 (1943) Twohey’s, Alhambra | Remains of L.A.
-Big and roomy, walls and ceilings done in turquoise and orange, with a large waiting area in the front, a counter with stools beyond that, and booths and tables in the room to the left. Hanging lamps, some red and cylindrical and others white and angular, hanging from an arching ceiling with lots of curves and slopes. The exact coffee shop I imagine when someone mentions a coffee shop. 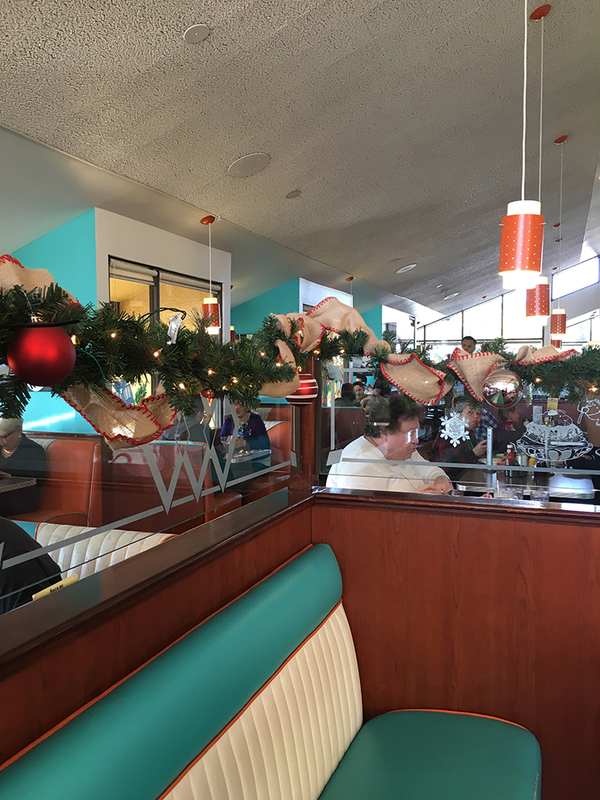 It was late December when I went, so there were Xmas decorations everywhere, including an enormous nutcracker soldier guy by the door, and several more nutcrackers in the window between the kitchen and the serving area. I’ve always liked nutcrackers. They look so silly and yet so earnest. -I was determined to not get yet another patty melt, so I scoured the menu and finally chose the “Huntington” which is a sandwich with turkey, tomato, avocado, swiss cheese, and ranch dressing, except I said no dressing, with fruit on the side. I got it partly because it sounded delicious and partly because I love the Huntington Gardens, which are nearby. I used to have a year pass so I could visit them all the time, but I almost never get around to going anymore. I might do a blog post about them someday. The sandwich took ages to come and then when it did there was mayo on it, and I had to send it back because I’m allergic. But when I finally got to eat it, it was fantastic, probably the best turkey sandwich I’ve ever had, even though it was that kind of huge sandwich that is almost impossible to fit in your mouth if you’re not a giant. -There’s an In-and-Out next door, and as is usually the case with an In-and-Out, the line for the drive-thru was super long and the parking lot, which they share with Twohey’s, was full. I had to park way down the street and walk, which was fine because of exercise, but it would be annoying if I were in a hurry or something. I bet anyone who has to share a parking lot with In-and-Out just hates it. 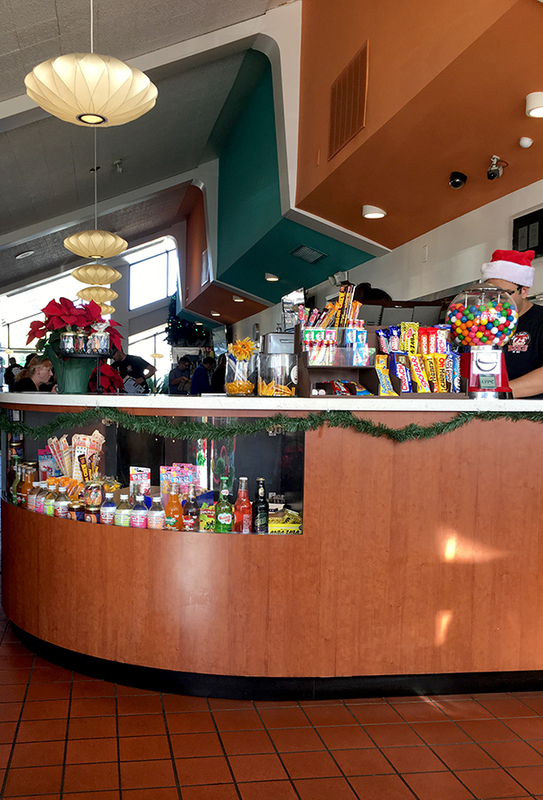 -The front waiting area was very crowded with people waiting for tables, and there was a man in a Santa hat standing behind a counter taking people’s names and calling out “Jones party of five” and whatnot. I told him it was just me and asked if I could sit at the counter. He said, “sure it’s all yours,” but then there were no empty seats at the counter. So I hung out in the lobby for a good long while, eventually grabbing a spot on the turquoise bench just inside the door. The “leather” of the bench was worn, with bare spots, but the color was perfect. After a while I got nervous because I couldn’t quite see the counter and stools from where I was, and I wasn’t sure I’d be able to tell if someone got up, so I went and sort of slouched against the wall nearby. I considered asking if I could just be on the waiting list for a table for one, but he struck me as the type who would say that busy as they were, I needed to wait for a counter seat. Which is reasonable, I wouldn’t have been upset, but it’s the kind of interaction that seems unpleasant even if everyone is actually fine with it, so I didn’t ask. 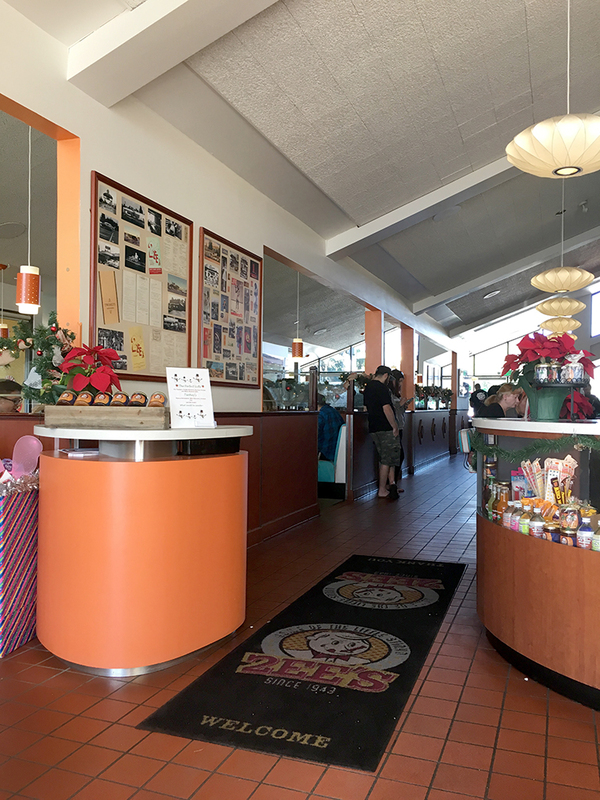 -On the large, curved counter with the cash register was a display of candy and unusual sodas for sale, as well as Twohey’s own chocolate syrup. One of the candy bars was a Sky Bar. My heart always jumps a little when I see those, because one time when I was a kid I saw one in a candy machine, and by the description on the wrapper I thought it must be the best candy bar ever. I ran to ask my dad for some quarters, and when I got back, someone had bought the last one. They didn’t have them in any of the stores around me, and it was years before I finally found one and got to eat it. It was pretty good. I don’t even eat sugar now. Even so, whenever I see them, I have a tiny moment of absolute excitement and joy. 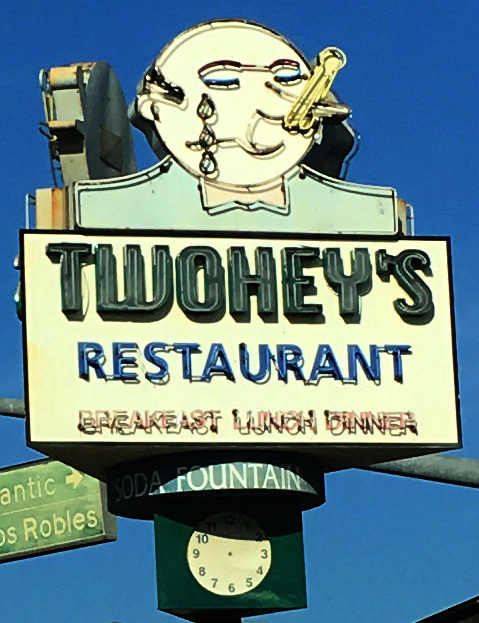 -“Twohey” was the last name of the people who started the restaurant. I wondered at first whether it was pronounced to rhyme with “chewies” or if it was like “not one ‘hey’ but two ‘hey’s.” But there were signs everywhere that said “2EEs” so it’s the “chewies” one. 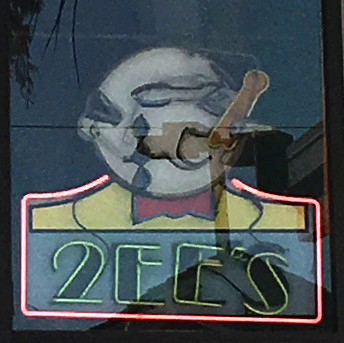 I couldn’t quite work out if it used to actually be called “2EEs” or what — a neon sign in the window made me think maybe. But then why change it? -I figured I should use the restroom while I was waiting for a seat, because no way would I risk abandoning a space at the counter once I had it. When I got back to the lobby, there was a guy by the register dressed as a monk. I mean, he either was in costume as an old-time monk, or he actually was a monk. Some monks still dress like that, the way monks used to back when, say, Friar Tuck was around. I only saw him from behind, and I have no idea if he was in costume or if that was just what he wore because of being a monk. Moments after he left, I noticed another guy in the waiting area had a t-shirt with a picture of a demonic nun. I wonder if the monk saw it. I wonder if it was awkward. 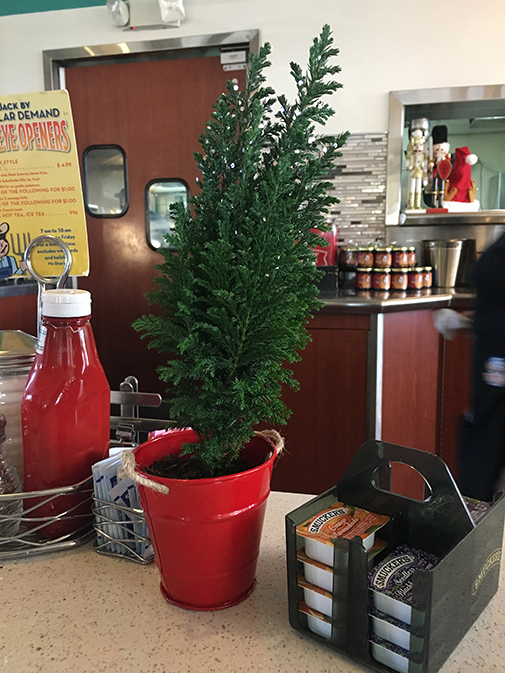 – Hanging on a wall by the bathrooms was a 3-D model of the Twohey’s restaurant and parking lot. It was made, I discovered by reading the plaque underneath, by someone named Bob Elsen, who presented it to the restaurant in May, 1985, and talked about how fondly he remembered Mr. & Mrs. Twohey, finishing with “Let this model of their creation represent the true respect I have for them…” I wonder if anyone will ever remember me fondly enough to make a 3-D model of something. -There were signs in the window for “part-time help needed; cashiers, hostess, busboys, kitchen crew.” It surprised me, since they’re closing so soon. But I suppose they still need people up until then. Also I guess they have another location, plus a food truck. -A little kid ran past me wearing a “Twohey’s” paper hat, like the hot dog stand hats, you know the kind, printed all over with Twohey’s logos and menu items. I wanted a hat too, not to wear but just to have and maybe put on one of the wig forms in our living room, but I didn’t quite have the nerve to ask for it, as anyone could see I was not there with a child. 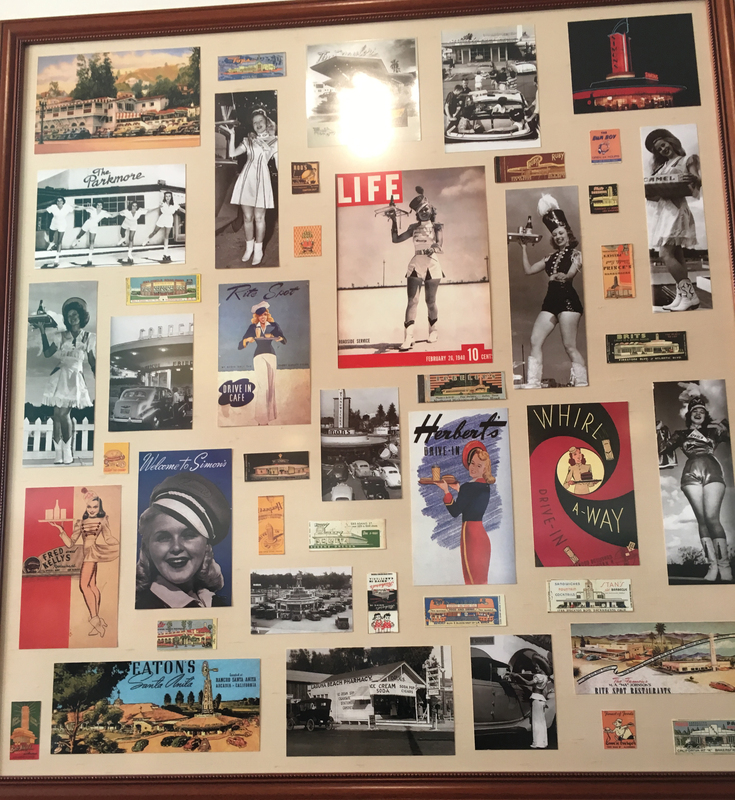 – Near the front entrance was a framed collage of pictures and menu covers and matchbooks from old restaurants, Herbert’s Drive-In, and Fred & Kelly’s, and the Whirl A-way. All of them look wonderful. I would give anything in the world to visit some of those old places, but they’re mostly long gone. I don’t know what it is about old restaurants that makes my heart ache, in such a good way. I could look at pictures like these for hours. Next to that was a frame with old Twohey’s menus, and pictures of the place from back when cars had fins and things. -There was Xmas music playing over the sound system. The song “Last Christmas” played while I was waiting. I’m sorry, but that song makes NO SENSE. Let’s look at the lyrics, okay? The first part is fine: “Last Christmas, I gave you my heart.” Sure, we all know what it means to give someone your heart. Only then we have: “The very next day, you gave it away.” What does that mean? How can someone give away the heart you gave them, when that of course is metaphorical and you didn’t actually give them anything tangible? Did the singer suddenly find themselves in love with someone else, to their great consternation, on account of their heart being given away? And finally, the singer swears that this year they’ll “give it to someone special.” Which means they somehow got their heart back from whomever it was given away to? No. Nope. Nonsensical song. -My favorite carol is Winter Wonderland, but the only version that played while I was there was all weird, with a slow tempo that just wasn’t right. It’s supposed to be a celebration, not a dirge. -While I was waiting for a seat, a man and his wife stood next to me for a while. The man had one of the worst toupees I’ve ever seen. I have a bit of a thing for balding men — as a kid I had a huge crush on B.J. Hunnicutt — so toupees mystify me. I always think “especially since they’re so obvious” but of course maybe they aren’t. Maybe lots of men around me are wearing toupees but they’re good toupees so I just can’t tell. -A woman near me got an ice cream sundae. It was the most perfect sundae I’ve ever seen. I mean it was like the platonic ideal of a sundae. I’d think it was made of plastic if I hadn’t watched her eat it. According to the menu, the Sundaes are bittersweet, and famous. I am certain that if I was still able to eat those things they’d be my very favorite ever. -While I was waiting, someone got up from the counter but I couldn’t tell if she’d actually left or just went to the bathroom or something. Her purse was still there. I discussed it with a guy nearby, who was also waiting for a space at the counter, and we agreed it wasn’t time yet. That kind of situation always stumps me, as to the proper behavior. And I always think everyone else knows how to handle it and I somehow missed out on the information… but who knows. Maybe it’s a mystery to them too, but they hide it really well. -Three seats at the counter opened at once, and I grabbed one and two men — who didn’t know each other but seemed to get along great right away –sat in the others. The guy next to me had never been to Twohey’s before, but the other guy eats there a lot, and recommended the breakfast or the burgers. The two of them talked nonstop the whole time they ate, mostly about restaurants in the area. It was amazing to watch how well these strangers could fall into conversation like old friends. I wonder if they’re both like that with everybody, or if they just had a magical chemistry with each other. I felt a little left out to be honest, but it was all right; I had a good book with me and also was taking notes for this blog. -There was some kind of deal going on for all-you-can-eat baby-back ribs, according to several signs and a menu insert, but since I know that all I can eat is somewhere between three and five, it didn’t seem cost effective. 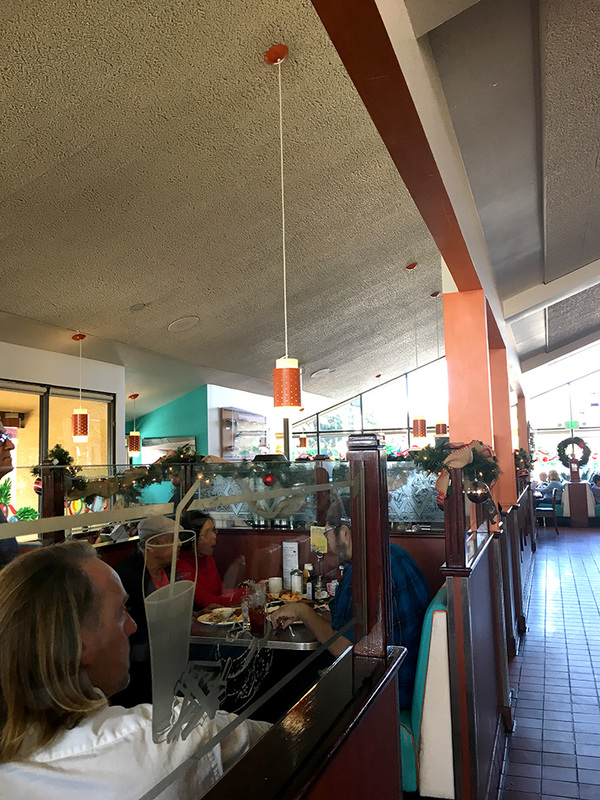 -The Twohey’s ceiling is painted in alternating blocks of turquoise and orange; the orange kept reminding me of something and then I realized it was the exact color of pumpkin pie. It made me want pumpkin pie. -The guy sitting two seats down from me informed his new friend that he made big animatronics for amusement parks and casinos. There’d been a break-in at their office that morning, the second one in two weeks. The burglars were caught on video but no one was hopeful that they’d be found. The guy didn’t even know what they were looking for. I couldn’t tell if they stole anything, it didn’t sound like it. Everyone agreed it’s a damn shame, and maybe someday someone will rip them off and they’ll know how it feels. -The man working at the front counter seemed too gruff for the Santa hat he was wearing, but then a customer went up to him and said “can I get a couple kids’ menus, Charley?” and they chatted and he seemed like maybe one of those guys who only seems gruff but is actually really nice and the favorite grandfather. – I waited so long for a seat that before I finished eating, “Last Christmas” started playing again. A different version with a different singer, but it still made no sense. – I could see, through the serving window, a huge bag of skittles on a shelf in the kitchen. What could they need that many skittles for? Surely they don’t sprinkle skittles on the sundaes, the way you might with M&Ms? It wouldn’t work. Skittles are too chewy. -A guy sitting near me said he wanted a turkey sandwich. I told him how good the Huntington was, so he ordered it and then I was super nervous until it came and he tried it and liked it. -As I was finishing, the waiter came up to me and said, hesitantly, “can you have ice cream?” He was clearly hoping to make up for the long wait followed by the mayo fiasco by giving me a free dessert. I said I couldn’t, but tried to convey with my smile how much I appreciated him. I left him a slightly larger tip than usual, too, because I could tell he felt really bad and I think maybe it really wasn’t his fault. 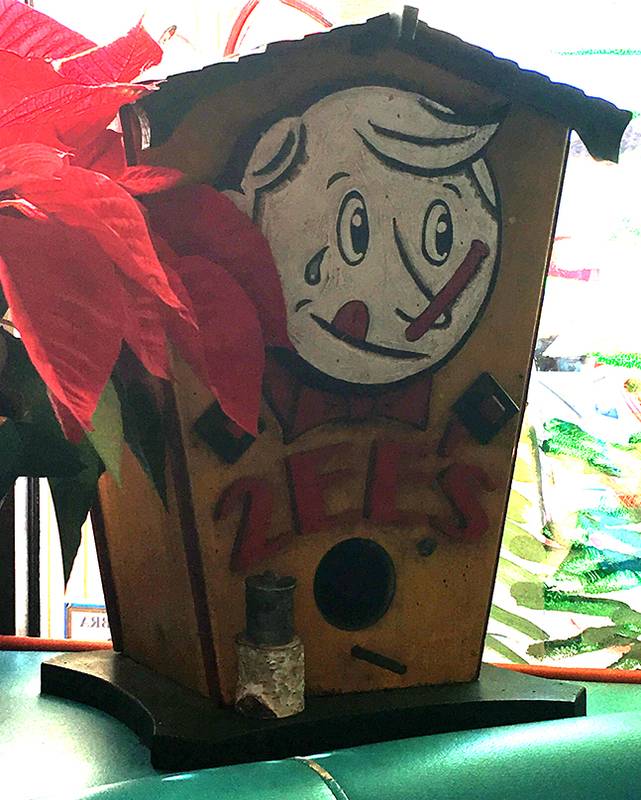 -The restaurant mascot is a guy with a clothespin on his nose, named “Little Stink-O. ” According to the menu, this is because a lady once said “oh stinko” when a nearby customer got a hamburger with lots of pickles and onions. It takes a brave person to make their restaurant’s mascot someone named “Stink-O.” That sounds like an insult but I’m genuinely impressed. -On the walk back to my car, I saw a little “wishing well” in someone’s front yard. I threw a penny in and made a wish, mainly because it’s probably really fun for the owners to find pennies inside and know people are using it. Also, who doesn’t have wishes. What I Read While I Ate: Trouble is a Friend of Mine by Stephanie Tromly, a great YA mystery. There are weird cults and adventures and charismatic love interests who take our hero on adventures to investigate weird cults — just exactly my cup of tea. What Sort of Ghost I’d Expect to Find if I Believed in Ghosts Which I do Not: A high school kid who would come in with his friends all the time but only ever got water. His friends just thought he wasn’t hungry but Mr. Twohey noticed things. He casually offered the kid a job washing dishes, acting like it was no big deal and pretending not to see the light in the kid’s eyes at the prospect of making some money. The kid worked hard and soon got promoted up to soda jerk, and was able to hang out with his friends and smile at the girls and still help out with bills at home. Mr. Twohey encouraged him to apply for a scholarship to college — no one had ever told him he was a smart kid before — and he always had a job waiting for him when he came back in the summers. Mr. and Mrs. Twohey were like second parents to him, and he never forgot them. As important and busy as he eventually became, he had lunch at Twohey’s every Sunday, and his kids worked there through high school. 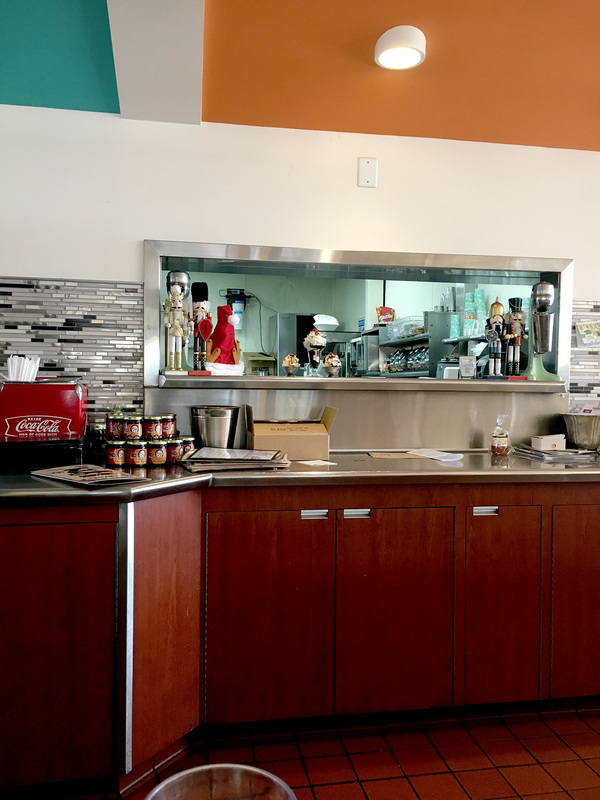 Now he leans on the counter and smiles, wishing he could still make those perfect sundaes. I wish I still drove, I’d try this place, but it’s too far by taxi. Thanks, for an entertaining post. I’ve missed this; welcome back. Twohey’s completely remodeled in the late 70s, and they really ruined the place. The old joint was incredibly 40s-ish. Imagine a super Bob’s Big Boy, but much more oddly conceived. It would have been a major showplace today.